The Guest Profile window will open automatically when you make a reservation or check in a guest. You also can access the guest profile from an existing reservation or folio. You can access Guest Profile by clicking the People/Profile button on your Execu/Suite toolbar. For most properties the Profile Entry and Lookup window will open first, allowing you to search the database for existing guest profiles. 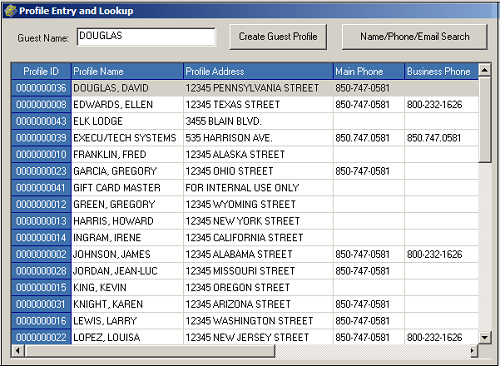 As you enter the guest name Execu/Suite will search and start displaying existing profiles. If you see the profile for this guest, click the name with your mouse and then click "Get selected" at the bottom of the profile screen (not shown). If you do not see a profile for the guest, then type the entire name for the guest, such as SMITH, GEORGE and then click "create guest profile" or hit Tab then Enter. The Guest Profile window will open. If you know that a profile exists for the guest, search without entering the guest name. There may be spaces in front of the guest name or it may be misspelled. If you still cannot find a profile, print an Activity Log for Name Changes. This is the Guest Profile window. Moving from field to field, it is quicker to press Enter than to use your mouse. "Profile ID:" is preset by the system and is not changeable. "Company:" identifies the company (01-99) you are in and is not changeable. "Guest Name:" may be up to 30 characters. Common ways to enter guest name are LAST/FIRST or LAST, FIRST. It does not matter but you should be consistent. There is an option in MENUINI.FIL that will allow you to enter first name, last name, and salutation into separate fields. The default is quick entry in which you enter the name in one field. "Guest Address: " Each address line allows up to thirty characters. When you press Enter your cursor will move to the Zip field. If you enter the ZIP or postal code, the city and state/province will populate if in the zip code database. "City/State/Zip: " The city may be up to 30 characters. State allows 2 characters. Zip allows 11 characters. For the city/state to populate, US codes should be five characters such as 32401 and Canadian codes should be six characters and a space such as G1A 1C5. "Guest Email:" A setting in Guest Profile Tools determines whether this is a required field. If you enter a guest email address, Execu/Suite can send confirmation letters and folios via email. "Market:" From the drop-down select a market segment to define the type of guest or why they guest is staying at hour hotel. (Examples: corporate, sports, military). These are user-defined in the Hotel Control Files setup. 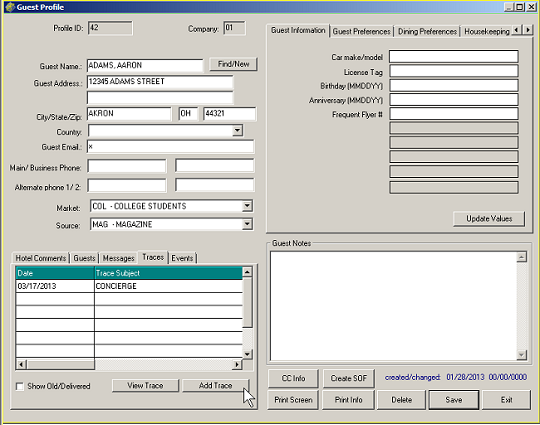 "Source:" From the drop-down select a source of business to record how the guest was referred or heard about your hotel. (Examples: website, Expedia, friend of owner). These are user-defined in the Hotel Control Files setup. The bottom left Guest Profile Entry screen contains five tabs. "Hotel Comments" Each field allows up to thirty characters. The comments remain with the profile and will be available for future stays. If you wish to make a comment for this stay only, you may do so in the reservation. "HOTEL Folio Comment" will (by default) print on the confirmation letter, registration form, and folio. Do not type anything you do not with the guest to see. This comment (by default) also prints on reports such as Room Inventory. Comments 2 and 3 These two comment lines do not (by default) print on the confirmation letter, registration form, or folio but your configuration may be set to print these. If you have user-defined comments then a little window will popup with specific prompts where you will enter specific user-defined information. "Guests" allows you to enter additional names and email addresses for this guest without creating new profiles. "Messages" allows you to type messages for guests. When the guest profile is accessed (via the reservation or at check-in), a popup will notify you if there is an undelivered message for the guest. 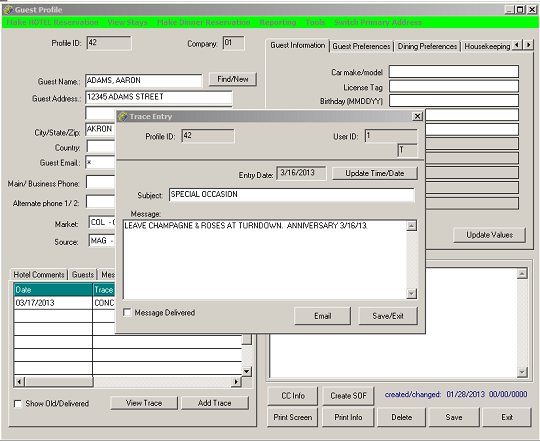 "Traces" allows you to type internal messages for staff. When the guest profile is accessed, a popup will notify you if there is an undelivered message for the guest. You also can print Trace Reports by date range. "Events" allows you to import an Outlook calendar. This feature is rarely used; if you decide to use it you should have a designated calendar to import so that only relevant events are imported. The events are not guest-specific; all profiles will contain the same calendar information, such as a sporting, event, a jazz festival, an art show, etc. The calendar is not automatically updated. If you add new events to the Outlook calendar, you will need to import it again. The upper right Guest Profile Entry screen contains five tabs. The first four tabs may be renamed to suit your purposes. See Guest Profile Tools . The information in these tabs may be printed by date or date range in Print Guest Preferences . "Guest Information" You may enter additional guest information here. This may contain user-defined fields or a free-form comment area, as determined in Guest Profile Tools. You may use these fields in any way you wish unless specified otherwise by Execu/Tech. This information can be included in Arrival/Departure reports. "Guest Requests (Guest Preferences)" You may enter guest preferences or any information you wish. "Dining Preferences" You may enter guest dining preferences or any information you wish. "Housekeeping" You may enter housekeeping requirements or any information you wish. Note that this information does not print on the Housekeeping Report. You may print a Guest Preferences report. "Reservation History" This shows dining stay history for the guest if you are using Execu/Tech's Dining Reservations module. Otherwise, for hotel reservations and stays, you can go to People/Profile, select the guest's profile, and click "View Guest Stays"
The lower right Guest Profile Entry Screen contains an area for additional notes. This area also includes buttons for optional additional functions. "Guest Notes" allows you to type additional notes or comments. You may use this area in any way you wish. "Print Info" will include this information. "CC Info" is no longer used. You should correctly validate a guest's credit card when you make a reservation by clicking the "validate card". Note that validations drop off after an internal determined by your merchant services provider and should not be stored for possible future stays. At check-in you should click "authorize card". 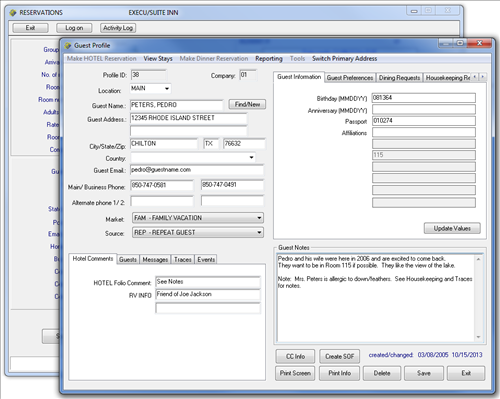 "Create SOF" allows you to create a special order form for billable services not provided directly by the hotel. Examples include babysitters or floral deliveries. These are rarely used but handy for certain properties. "Print Screen" will take a capture of the profile screen and send it to the printer. 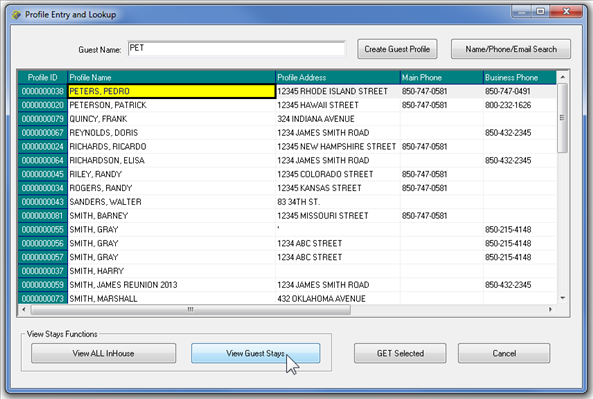 "Print Info" will print a "Guest Profile Address Card" that includes contact information and profile notes. Click HERE for a sample. These are rarely used except for certain properties. "Delete" allows you to delete the profile. You should take great care when deciding to delete a profile; it cannot be restored. If you are deleting one of a duplicate profile, you should make sure you have copied any necessary information into the one you are saving. "Save" will save the profile and exit the screen unless you accessed the screen via the People/Profile icon. In that case click "Exit". "Exit" will exit the profile. Click here to avoid making improper changes to guest profiles. 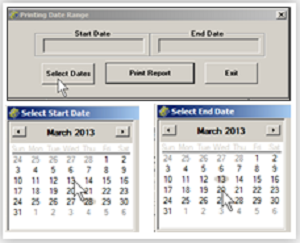 You can print Trace Reports which can print by date range. You can print Guest Preferences which can print by date range and can include any or all of the four information/preference tabs. You can print Guest Profile Address Cards which include the guest's contact information and any comments in the "Guest Notes" field. You have the option to include the profile custom tabs on the Arrival/Departure Lists. The Reservation Status Reports will print "Guest Notes". To create a Trace, click the "Traces" tab and then click "Add Trace". Enter the trace subject and the body of the message. 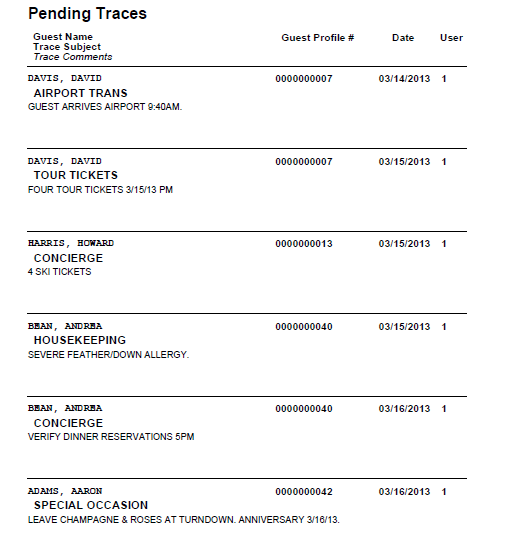 The trace subject might be a department (housekeeping, front desk, etc.) or the subject of the trace. You may set the date if you wish it to print for a specific date. You may enter information in the Guest Information, Guest Preferences, Dining Requests or Housekeeping Requests tabs. These can print on a Guest Preference report. Note: Since these tabs can be renamed under Guest Profile Tools, your tab titles might be different. 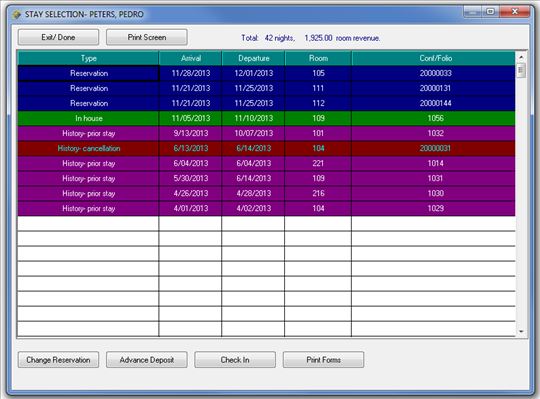 To print the Trace Report or the Guest Preference Report, go to Front Desk > Print Guest Profile Traces/ Preferences. At the prompts, enter a start and end date. Below are sample Trace Reports. To print the Guest Notes, click the "Print Info" button. This will print the guest's contact information plus the Guest Notes. When Profile Entry and Lookup window opens, you can click "View ALL InHouse" to display a list of in-house guests and today's checked out guests. You may click any of the displayed names to display the folio, etc. You can click "View Stays" to view the reservations and history for this guest. When you click "View Guest Stays" all of the stay information for the guest will display, including folios in guest history, in-house folios, reservations, cancellations, and no-shows. You can click any of the stays to display the appropriate buttons at the bottom of the screen such as those shown above. You can set up main and secondary profiles for each guest although we do not recommend this except in specific instances. Examples of when you might do this is when the main profile is the guest and the secondary profile is the guest's secretary or assistance; or when the main profile is the guest and the secondary profile is the guest's spouse. This typically is done when the spouse or assistant is the main contact rather than the guest.